ProForm 14.0 CE elliptical is a superior elliptical fitness machine. It offers numerous features and benefits that make it an excellent choice if you’re looking to get into shape and drop those extra pounds. Get ready to get better, faster results in less time with the ProForm 14.0 CE Elliptical. Compatible with iFit Live Technology, you’ll get workouts Powered by Google Maps, training with Jillian Michaels and automatic resistance control, this wireless technology delivers smarter workouts and faster results! And, with a Power Intensity Ramp, you can isolate your glutes, quads or calves with the touch of a button. You’ll add definition to your lower body while you increase upper-body and core strength. Other features include 18 workout apps, 14 Quick Resistance Levels and a 300 lb. weight capacity. 18 Built-In Workout Apps: Get the workout you want with 18 built-in workout apps. Workouts are designed by a Certified Personal Trainer and automatically adjust the resistance of the elliptical to maximize your time for faster results. The simple navigation of the apps makes it quick and easy to pick your workout and get going. iFit Live Technology Compatible: Get smarter workouts and faster results with iFit Live Technology. Featuring workouts Powered by Google Maps, training with Jillian Michaels and automatic resistance control, this wireless technology is the ultimate workout experience! Customize your own fitness program, draw a map or select a course online to get started. As you work out, your results are uploaded to iFit.com in real time, helping you manage your online profile. This incredible feature provides exciting new opportunities for you to tour the world, run and train for races and compete with others, right from your own home! iFit Live Technology connects to your home’s wireless network for real time feedback. It’s advanced technology that is easy to use! Upper-Body Workout Arms with Soft Grips: Burn more calories and add muscle tone with the upper-body workout arms that provide a great total-body workout and increased cardio benefits. The soft grips provide the perfect balance of comfort and support, allowing you to focus on your workout. 10-25° Power Ramp: Get better results by changing the incline of the elliptical. It will modify the shape of your stride, which alters the muscle groups you focus on during your workout. Target your glutes, quads and calves with the touch of a button for faster results! Select 10, 15, 20 or 25 degree incline adjustments to target specific muscle groups. 1-14 Digital Quick Resistance Levels: Instantly adjust your resistance at any time during your workout with the touch of a button. Select between 14 resistance levels for increased calorie burn and higher intensity. Oversized, Cushioned Pedals: These large pedals allow you a number of different foot positions and provide great stability as you exercise. 5" Backlit Display: Perfectly clear and easy to read, this display has a large viewing angle so no matter how tall or short you are, you can always keep track of your workout progress. It displays your speed, time, distance, pulse, resistance and calories burned. RaceTrack Display: This feature allows you to monitor your progress in a track-style display so you always know where you are in your workout. 18" Stride Length: Enjoy long, full strides and develop lean muscles with this generous 18" stride length. 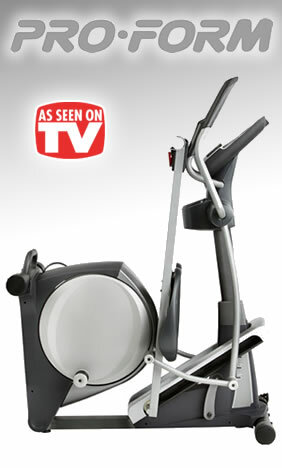 Warranty: The ProForm 14.0 CE Elliptical is protected with a Lifetime Frame Warranty and 1-Year Parts & Labor Warranty. The ProForm 14.0 CE elliptical is an exceptional and full-featured exercise solution that is designed to provide you with a vigorous and superior quality workout. The 14.0 CE elliptical from ProForm will have you getting fit and dropping those extra pounds before you know it. If you’re serious about getting into shape and staying that way ProForm offers the answer you’ve been looking for. What are you waiting for? Order a ProForm 14.0 CE elliptical and get ready to get into the best shape of your life.